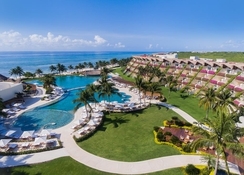 Discover the luxurious all inclusive property of Grand Velas Riviera Maya, which hugs the Caribbean Coast in the Riviera Maya. 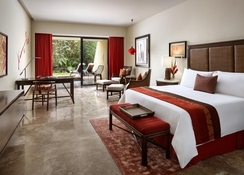 Surrounded by well-preserved mangroves, enchanting natural cenotes and acres of lush tropical rainforest, this award-winning hotel is an authentic sanctuary perfect for couples, families and solo travellers seeking a serene getaway in paradise just 10 minutes from lively Downtown Cancun. Relax at the beach or the hotel swimming pool (complete with beach and pool waiter service), take part in exciting watersports, unwind in the exclusive spa, discover the fitness centre, and keep the kids entertained with daily activities or at the fun-loving Kids' Club. Indulge in the select gastronomical delights at Grand Velas Riviera Maya's signature restaurants and bars, serving a mixture of International cuisines to suit all tastes. 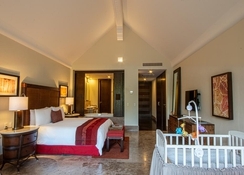 With three unique environments to choose from in this luxury resort, guests can tailor their stay to suit them - including couples, families and solo travellers alike. 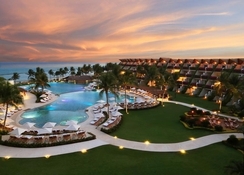 Grand Velas Riviera Maya is an unparalleled resort in the Mayan Riviera. From the crystalline waters of the Caribbean Sea to the depths of the cenotes and the exotic jungle, the Riviera Maya is a paradise for unforgettable adventures. Discover the eco-tourism activities offered by the Sian Ka'an biosphere reserve and the Xcaret and Xel-Ha theme parks or embark on an archaeological adventure touring Tulum, Chichén Itzá and Cobá. You cannot miss the experience of swimming with dolphins. 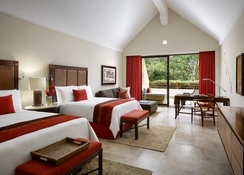 Guests can choose between three unique environments serving romantic getaways, family fun and those after relaxation. The Grand Class Experience is suited towards guests on a couples' escape with elegant oceanfront suites, a private terrace, butler service and a massage area – ultimate bliss. Ambassador Suites will be the ideal option if you're looking for an unparalleled family experience, with suites surrounding the infinity pool, home-style amenities and close location to the Kids' Clubs and games. 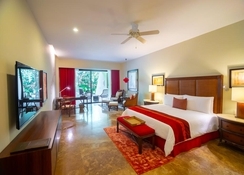 Finally, the Zen Grand section of the hotel gives guests an insight to jungle life, surrounded by tropical foliage and a koi pond, a short shuttle ride from the resort – for a true away-from-it-all experience. The dining experience at the Grand Velas Riviera Maya is exceptional. Here, each dish is a tribute to the traditions of French, Mexican, Italian, Asian cuisine. A symphony of flavours await you at the in-house restaurants, including Piaf Restaurant (French), Frida Restaurant (Mexican), Sen Lin (Asian) and more. Bars at the restaurant are Karaoke Bar, Koi Bar, Aqua Bar and more. 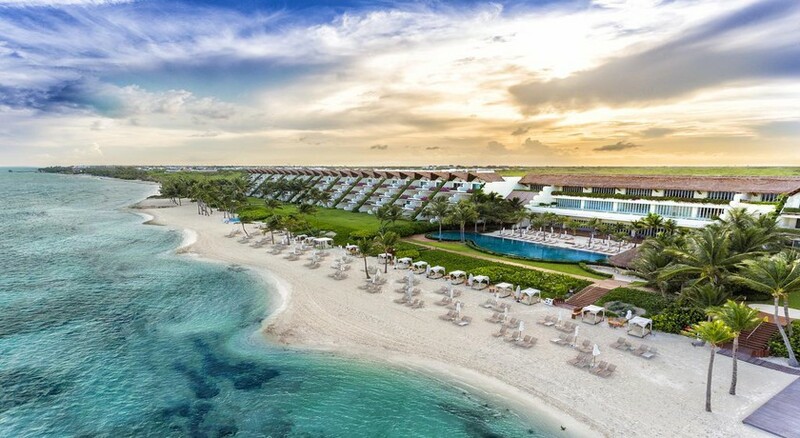 Your journey towards relaxation and restoration begins at the SE Spa by Grand Velas, which was named as one of the World's Best Spa by Virtuoso in 2010. Its rituals based on ancient techniques combine the most advanced technology in treatments, facials and body wraps. The hotel also has a private plunge pool, swimming pool and beach concierge, mixology classes, Kids' Club, Teens’ Club and snorkelling, kayaks and boogie boards.